Welcome, Sornieth, to Starfall Celebration 2018! The isles are cast in perpetual twilight. Lights shined through the various windows of the Observatory, and music heard even by those still making their way through the Starwood Strand. The bottom floor of the Observatory had been cleaned up and repurposed into a massive dance floor, a large archway dotted with runes glowing slowly at the back of the room. Three statues of rhodochrosite--one of a wildclaw, one of a pearlcatcher, and one of a nocturne--lined its base, humming faintly. A wildclaw trotted between them, scribbling in a notepad despite the noise around him. “It was one year,” Hathor said. Visit our Out-of-Flight Raffle for payouts, prizes, and delightful badges while every dragon in Arcane gathers together for the upcoming rave! Arcane's Art for Fodder thread is open for business! Come check out dragon and gijinka art, bios and Starfall exclusives! Pretty things and surely there will be something for everyone! There is even a nice exclusive accent made just for Starfall! This is a Push Week only event run by Jazzyleia that takes Baldwin materials in exchange for tickets to an exclusive raffle! All materials donated go to our In-House BAP which is an organization that helps brew up Baldwin items for raffles! So if you have some extra lying around, think about sending over to them! Do you like writing stories? Do you hate standing in front of a group of people you have no idea who they are and reading a speech (cause schools will be the death of all of us). Then this is the competition for you! Come and write some speeches and then "perform" them for the enjoyment of all with never having to face anyone. This event runs for both push and fest week by the amazing Argante. RockyLemons is running a quick going event titled Ten Words. In this game, you want to finish the sentence with the correct word! A game is posted usually once an hour, with a spreadsheet updated so you can see exact times. Help decipher the message left on the scrolls and you can win some treasure, a pretty badge, and tickets to our OOFR! This is running only during push week. 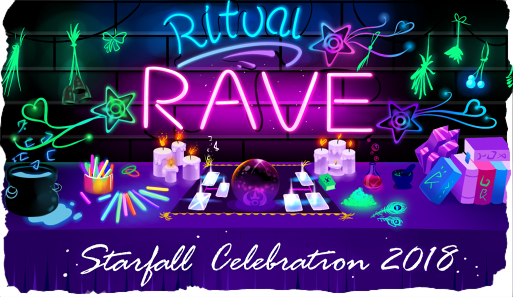 These events are running the week of Starfall Celebration, so don't worry if the links don't work! They will once the festival begins! Want a ping when these events open, or just when Starfall begins? Add yourself to the self-editing pinglist! Click here! This is a Festival Week only event where you can come on over and send some cute little cards to fellow members of Flight Rising! We have quiet a few to choose from and they are all free! Send as many as you would like (you can even send one to yourself, we won't judge). Do you love listening to music? Do you want to possibly win a prize for liking music? Well then this is your event! ARCN 011 is a playlist competition where you can submit up to three songs and possibly win a prize! This event runs during both push and fest week brought to you by Nighttyger! Want a quick and easy way to link to our OOFR, Hub, or Arcanart? Well then you are in luck! Go ahead and take the banner below! Finally thank you other Dom Leads for always proofreading and telling me where you think something would fit better. You all rock! We Are Now OPEN For Posting! !